It’s so easy! This kind of dough doesn’t consume a lot of time. I love it even for homemade pizza. And tarte flambée some kind of pizza actually is, right? 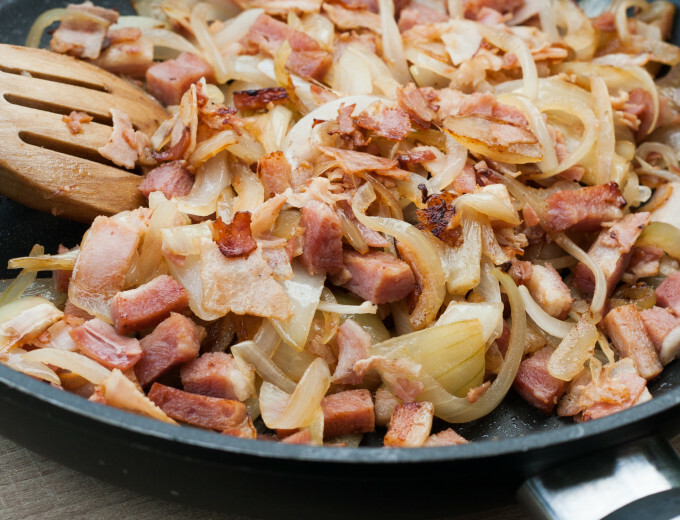 French-German pizza with lots of sauteed onions and bacon a sour cream… I hope you would love it at least as much as we do. 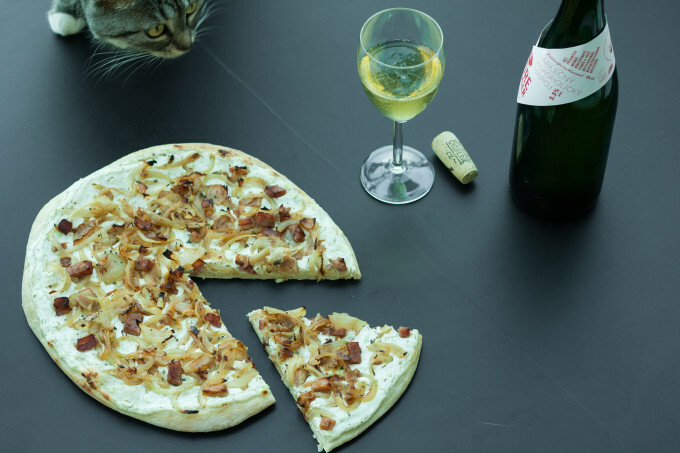 Goes perfectly with wine (choose white – you can see why after reading about tarte flambée and Alsatian cuisine) or cider. This sour pie comes from Alsatian cuisine. It composes of yeast dough (similar to pizza dough) covered with fromage blanc (kind of fresh cheese like curd) and/or crème fraiche (fat sour cream), onion and lardon/bacon. Sometimes gruyere cheese, mushrooms, or Munster cheese are added. 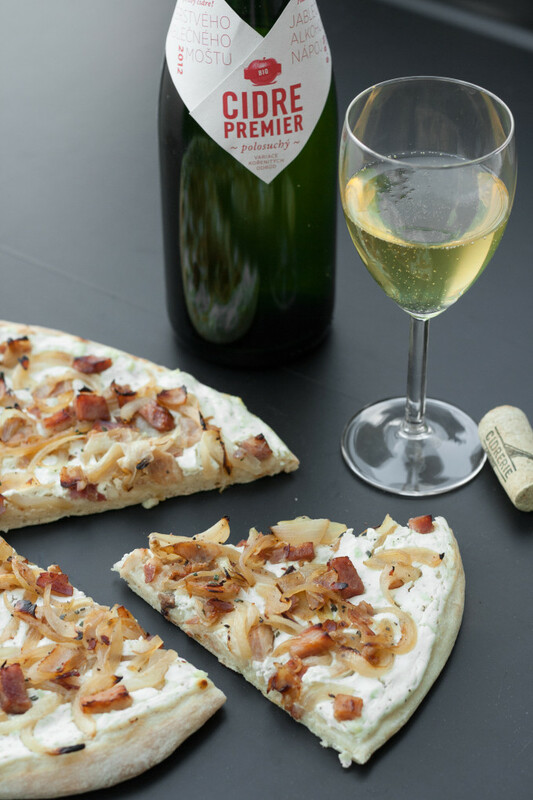 It’s said that tarte flambée was a dish that tested the heat of a wood-fired oven. The oven should be so hot that the tart should had been almost burned by the flames (the name literally means “pie baked in the flames”). In German it’s called Flammkuchen. Alsace is a small French region next to the German and Swiss borders. The capital city is Strasbourg. Its cuisine is hugely influenced by German tradition. Alsatian region is famous for white wines (vins d’Alsace), mostly the Riesling, foie gras (fat duck livers), sausages, sauerkraut, and also beer. First, prepare the dough. Mix the flour with salt, make a well in the centre. Add the yeast, sugar and few spoons of water. Mix a little bit and leave for 10 mins until the mixture comes foamy. Add the oil and more water. 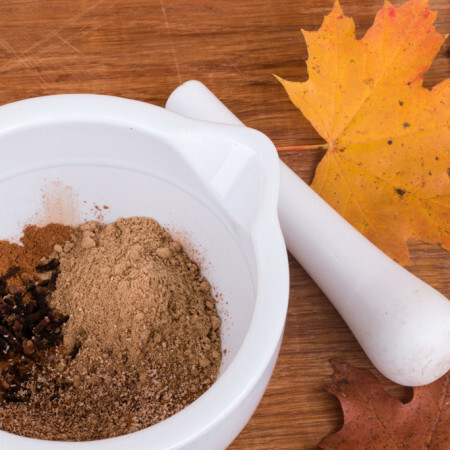 Stir to mix all the ingredients together. Then knead on a working surface dusted with the flour for about 5 mins until tight and smooth. Let rise for about 20 mins. Thinly slice all the onions. Slice the bacon. Preheat a large pan, add bacon and cook until just light brown. 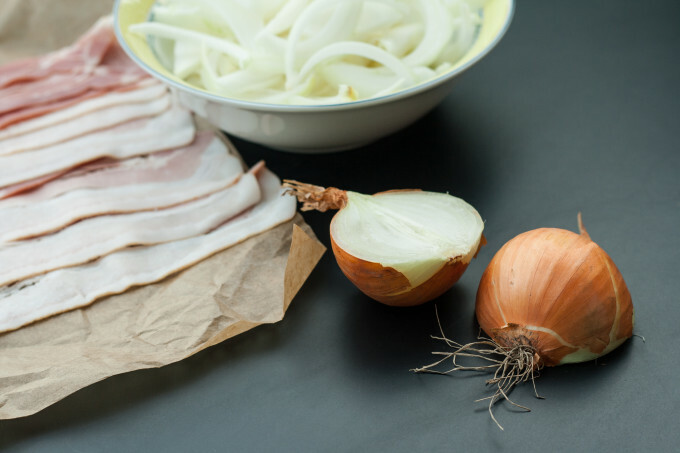 Remove the bacon and reserve on paper towels, keep the fat in the pan. Add onion, season with salt and pepper and cook on medium heat about 10 mins until soft and a little bit caramelised. You may need to do it in two batches. Add a splash of olive oil if needed. Combine the sour cream, the curd and puréed garlic. Season with salt and pepper. Divide the dough into two smaller balls. 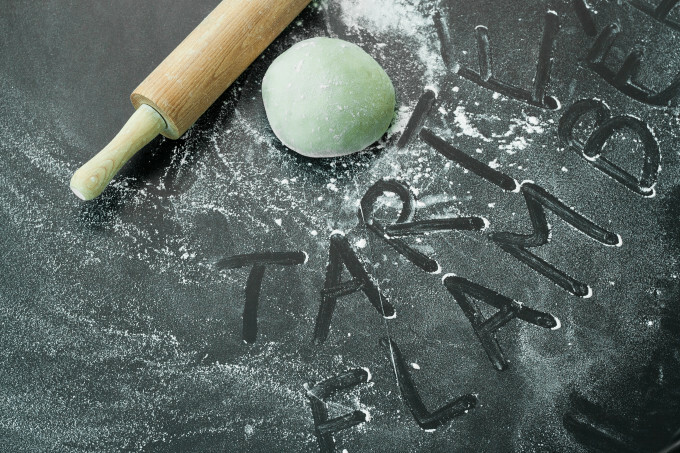 Roll out on a slightly floured baking sheet/paper/pad until 0.5cm thick. Spread the half of the sour cream with curd over the dough, sprinkle with half of the bacon, onion and fresh herbs. Repeat with the second half of the dough. Bake for 7 - 10 mins. Your tarte flambee looks wonderful. Perfect for a night in with a bottle of wine!